In May 2016, World Education Services (WES) conducted a survey of nearly 5,000 current and former international students in US higher education institutions. The results are focused on the US as the world’s leading study destination, and they carry with them some important recommendations and insights for international recruiters. In particular, Improving the International Student Experience: Implications for Recruitment and Support opens with an interesting summary of pre-arrival expectations of foreign students heading for the US. 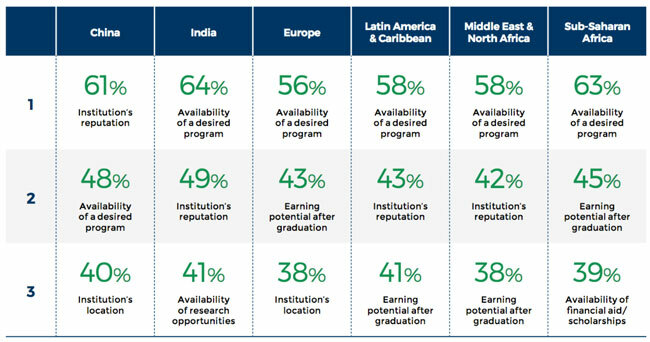 As the following infographic illustrates, quality of education and employment prospects were the dominant considerations for most students, with some notable variations by the students’ country or region of origin. The survey also explored the factors that led students to choose a particular US institution. Far and away, the major factor cited by survey respondents was the availability of a desired programme. Nearly six in ten students cited this as their main consideration, a finding that underscores earlier research as to the importance of unbranded search activity among prospective students. More specifically, Google research has shown that that nine in ten prospective students don’t know which school they want to attend at the onset of the search process and they reflect this non-brand orientation in their search behaviour with queries that are much more focused on specific programme or degree searches. Among WES survey respondents, Chinese students were a notable exception in this regard in indicating they were much more swayed by institutional reputation (61% of Chinese respondents indicated that this was the primary factor influencing their choice of institution). The WES survey also included a sample of foreign students enrolled abroad, but not in the US. Those respondents, including students in the UK, Canada, Germany, and Australia, exhibited a similar response patterns as to the major factors driving their decision to study abroad – that is, similar to foreign students in the US. Finally, WES also explored why students who chose not to follow through on intentions to study in the US what led them to change their plans. Nearly one in three cited the cost of study in the US as the main reason, with other common responses including failure to obtain admissions at their institution(s) of choice and/or failure to obtain a US study visa. For additional research on student preferences and motivations for study abroad, please see “New survey reinforces career goals a primary motivation for study abroad”, “Survey says employment prospects the key for postgraduate applicants”, and “New report tracks key influencers for international students”. This entry was posted in North America, Research, United States and tagged undergraduate admissions, universities with international students, education abroad, postgraduate student recruitment, study abroad.